Recall the mention earlier in this analysis, of Michael Mann's '8-ball hemorrhage' hint regarding the bleeding into David Bowman's eye, after Bowman injures his head when he is 'shot into' the emergency airlock of Discovery One. We may apply this hint to 2001 in a broader sense, once we realize that in certain scenes in the movie, the white, round EVA pods are being used to represent cue-balls (as used in various versions of the game of billiards - see screencap above), and Bowman and Poole (the latter's name is, in addition to being a reference to a gene pool, a reference to the game of pool), wearing their red and yellow space suits, represent object balls, that is, they represent the balls that are to be pocketed (as in the game of blackball - see the screencap above). Top left: After Poole's EVA pod (under HAL's control) has struck Poole, both Frank and the pod go careening off into space. This represents a cue-ball striking a yellow object ball. Top right: After Bowman has retrieved Poole's body from space, he is denied entrance to Discovery One after a brief standoff. "Behind the eight ball" (or "behind the eight") is a common idiom meaning to be in trouble, stymied or thwarted, in an awkward position or out of luck. [a] Above left: Bowman lets Poole go. 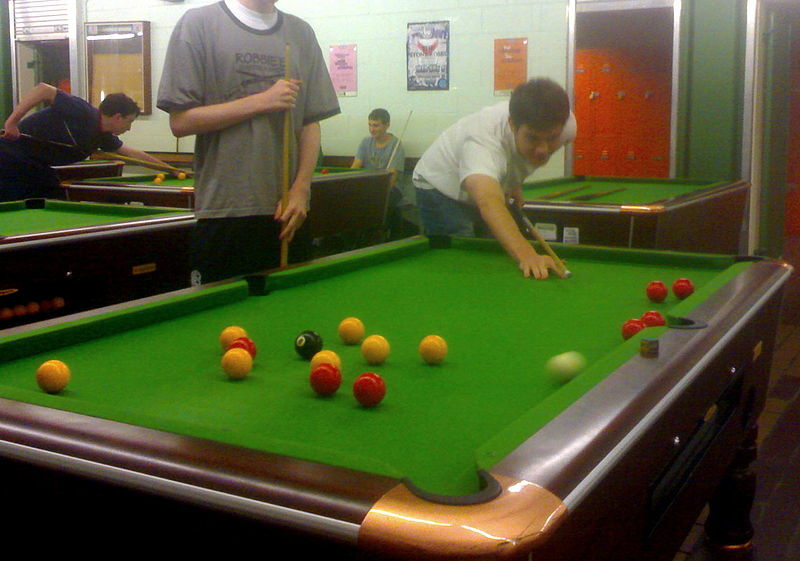 Above right: Bowman, in his red spacesuit, is 'shot' into the airlock 'by' the EVA pod (cue-ball); the airlock can be taken to represent a pocket in a billiards table. a. Wikipedia, 'Kelly pool: Behind the eight ball'. Web, n.d. URL = https://en.wikipedia.org/wiki/Kelly_pool#.22Behind_the_eight_ball.22.